A new technology for energy storage is on the rise, and ETIA is proud to be a part of this adventure! We were happy to deliver the first demo unit demonstrating SaltX EnerStore process for unique energy storage application. Renewable energy is replacing fossil fuels globally and therefore it is a growing demand for balancing, peak shifting and abortion technologies to supply renewable energy when needed. Today there are many different geographies that have an increased supply of renewable electricity and at the same time have a demand for heat and steam. In Europe for example, 50 percent of the energy consumed is for heating. EnerStore is an energy storage solution that stores electric power and releases heat and steam – providing cheap peak shifting of energy to cities and industries. The solution is based on a nano-coated salt – a patented SaltX solution, which performs energy charging and discharging by using ETIA patented Spirajoule® units. SaltX Technology – www.saltxtechnology.com – develops and sells patented energy storage technology. Main customers are major global OEM partners and energy companies such as Alfa Laval, Vattenfall, Mobile Climate Control and Rheem. SaltX Technology’s share is listed on Nasdaq Stockholm First North Premier. SaltX Technology’s Certified Adviser is FNCA Sweden AB. 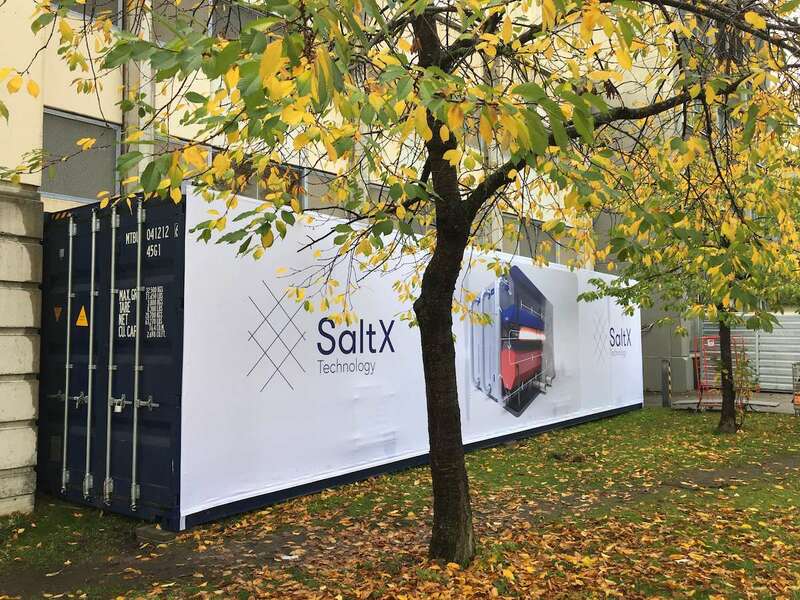 Outside of their headquarters in Stockholm, SaltX displayed the first demonstration unit for partners, investors, press and other stakeholders. Stockholm is the first stop on the world tour where SaltX technology will be displayed in cities like Milan, Boston and Shanghai. The demonstration unit is a copy, but smaller scale, of the pilot plant that SaltX is installing together with Vattenfall in Berlin, Germany.